Earlier this week LucasArts unloaded the very awesome news that it has commenced to re-releasing many of its classic games via Steam! I had never used Steam before, but the prospect of once again playing Indiana Jones and the Fate of Atlantis (right) was too good to pass up, so I went to the Steam site and purchased the game. For $4.99 you get the CD-ROM "talkie" version from 1992, guaranteed to run on a Windows Vista system! 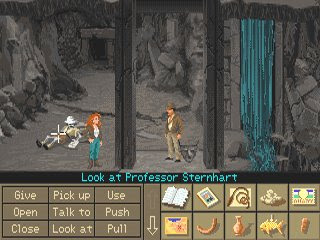 LucasArts is also publishing anew The Dig (LOTS of people no doubt happy about that one), Indiana Jones and the Last Crusade: The Graphic Adventure, Armed and Dangerous, LOOM, LEGO Indiana Jones: The Original Adventure, Star Wars Battlefront II, Star Wars Republic Commando, Star Wars Starfighter, and Thrillville: Off the Rails. And LucasArts has promised that many more classic games will be coming over the next few months. "One minute you're on the road, riding. Not a care in the world. Then some guy in a suit comes along, says he's got a deal for you and your gang. But when you come to, you've got a lump on your head, the law on you back, and a feeling in your gut that the road you're on is about to get a lot rougher..."